The history of Ware Park goes back to the days of William the Conqueror, and it indeed makes interesting reading. The crucial thing here, however, is that, sometime around 1870, it was bought by William Parker JP. He obviously regarded it as a lucky buy, because, in a speech made by him in 1871, he referred to a ‘large Hertfordshire diamond’ that he had found in Ware Park, valued at £333,000! He also referred to flint implements that had been discovered there, and to two large old oak trees, from which it was reputed the Danes had first been sighted coming up the River Lea. . . so the likely date for this is assumed to have been c1880. That may be somewhat open to question, but there is no doubt that the contractor was James Pulham and Son. ‘pleasure grounds and gardens surrounding the house, with lawns, cedar trees, a sunken rose garden on the centre lawn, a tennis lawn, and a summerhouse surrounded by rock garden’. These all point to the possible involvement of the Pulhams, although it is difficult to ascribe a precise date to it. The most obvious suggestion would be sometime around the time when William Parker was rebuilding or refurbishing his house after a fire, but that still leaves two possibilities – the first fire occurred c1875, and the second in 1912. The house had to be rebuilt, and was also extended after the 1875 incident, so it is quite possible that he also spent money on the grounds at that time – hence my suggested date of 1880. It is also possible, however, that this work was not done until after the apparently more extensive fire of 1912, when Mr Parker had some insurance money to play with. This is indeed a possibility, although one or two of the features on display tend to favour of the earlier date. 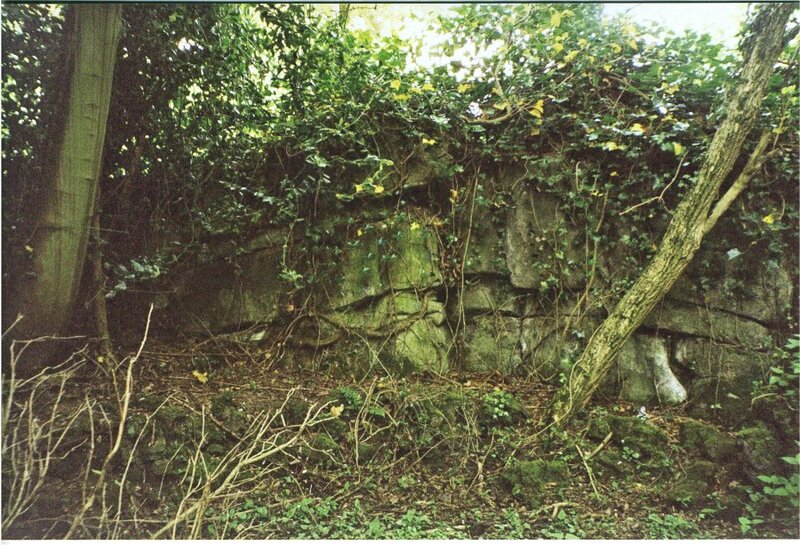 There was no sign, during my visit of 2003, of the sunken rose garden on the centre lawn, described in the 1919 Sale Prospectus, but the remains of the summerhouse and rock garden still survived, just beyond the typical Pulhamite rockwork cliffs, shown in Fig 1. There was also a tennis court close by, which may or may not have been the same as that referred to in the Prospectus. 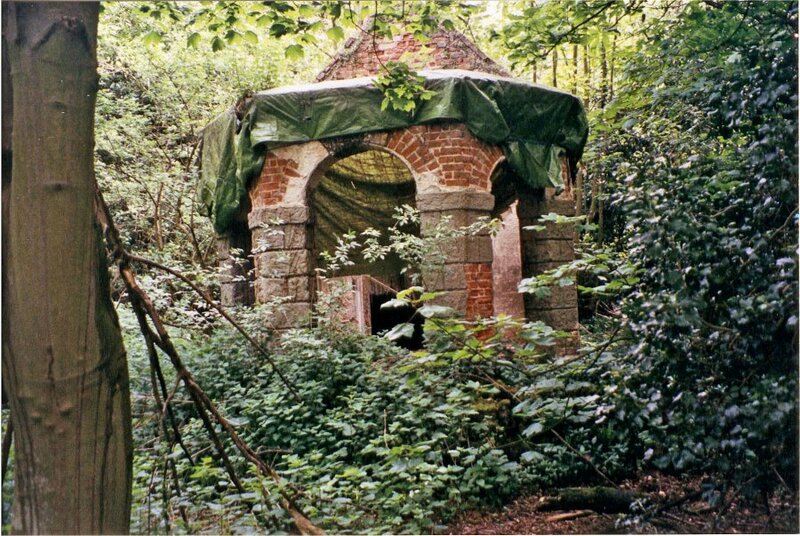 The Summerhouse is a little further on, and was in a very dilapidated condition, as can be seen from Fig 2. The roof had almost completely gone, and was covered by a tarpaulin, but one could see very clearly how the structure is basically brick-built, and covered by the well-tested ‘rusticated stone’ cement cladding. There is a small pool nearby that was completely silted up and overgrown, but its source of water was still visible. 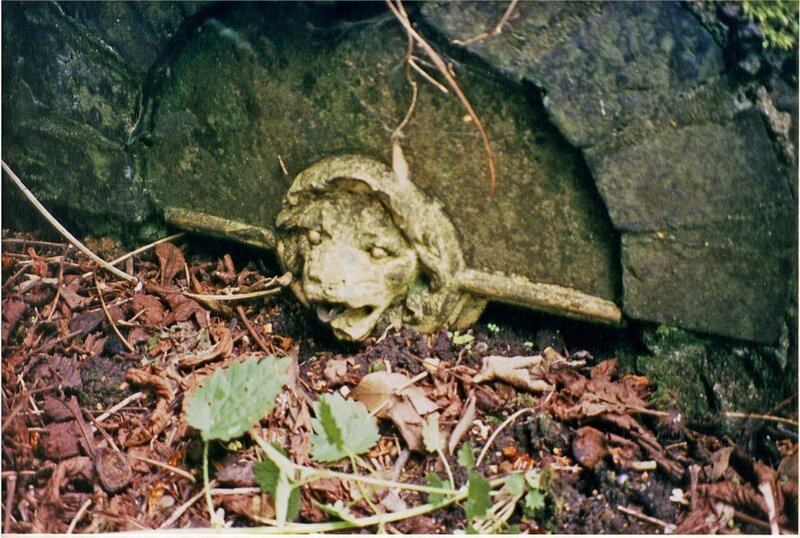 It is a lion’s-head outlet – shown in Fig 3 – which is just like the one in the Lion Grotto at Dewstow Gardens, described in Chapter 22 of Rock Landscapes: The Pulham Legacy, and it is the outlet of a pipe that must run from the small artificial lake a short way up the hill, the source of which is not known. There is another interesting feature on the way up the slope towards the lake. It is the remains of what had obviously been at one time a tiny chapel, although, here again, it is now not much more than a ruin. 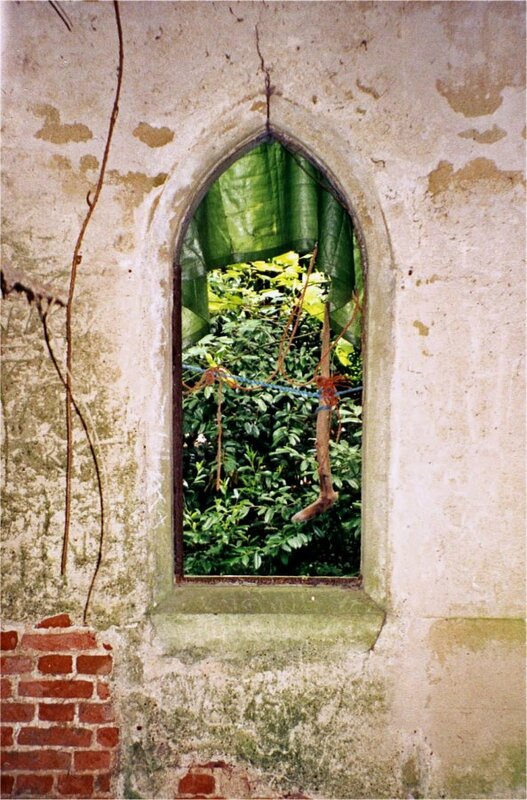 Its location and condition made this rather difficult to photograph, but the picture of part of the interior in Fig 4 is the result. On the way back to the house, there is yet another quite familiar Pulham signature. 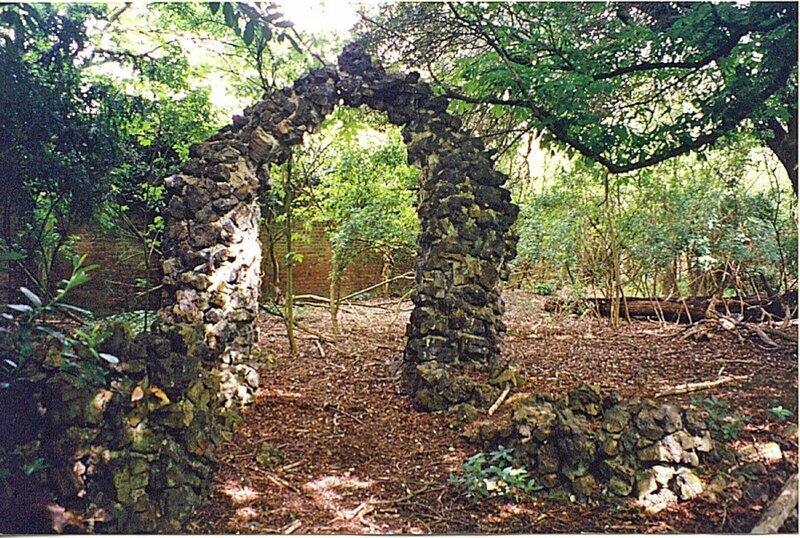 It was a ruined arch folly, standing all on its own amid the trees – just like the one at High Leigh, in Hoddesdon, described in Site of the Month #8, Jan 2012. 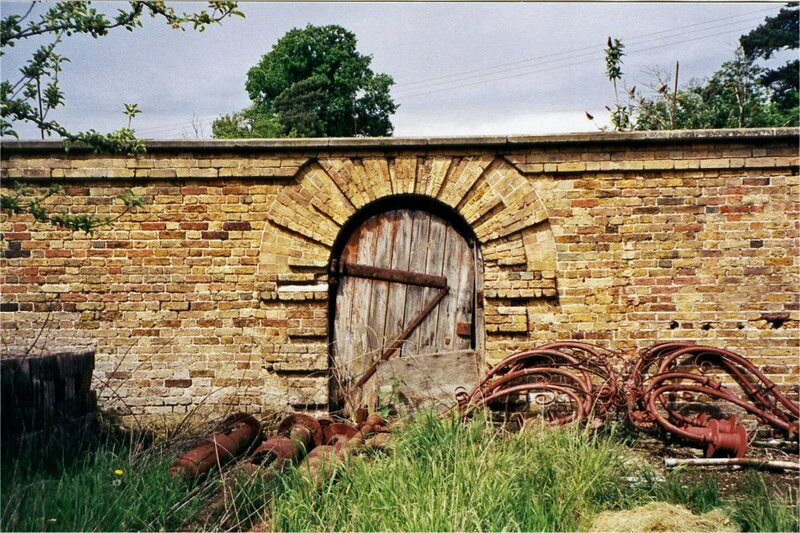 It is shown here as Fig 5, while Fig 6 shows a section of the old Walled Garden, which is very reminiscent of the one at Welbeck Abbey – see Site of the Month #24 – May 2013, Fig 2+. Examples like this can never be held up as indisputable evidence of the Pulhams’ involvement, but, when one sees such close idiosyncratic similarities in design, style, or feature – such as the ‘Pulham faces,’ for instance – cropping up in different places where the firm is known to have created the rockwork, ferneries, or glasshouses etc, it is difficult to avoid the conclusion that they are also likely to have constructed many of the other garden features – especially when they date from the same period as their known presence on site. Posted on August 1, 2015 June 4, 2016 by Claude HitchingPosted in Sites Month 2Tagged . . James Pulham and Son, arch folly, chapel, summerhouse, walled garden, Ware Park - Hertford, William Parker JP - Ware Park.